At the end of July one of our old robots was prep'ed for a take-your-kids-to-work day at Schenck where our long-term mechanical engineering mentor Mr. Chant works. 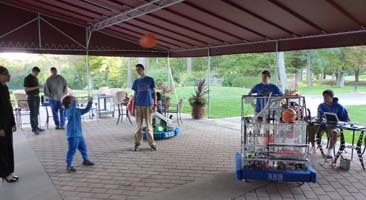 The Breakaway soccer robot used a flywheel as an energy storage mechanism to kick the soccer ball, and at the time (2010) Schenck had donated their services to balance that flywheel so that it spun very, very smoothly. So it seemed an appropriate robot for a demo at the Schenck facility in Deer Park. 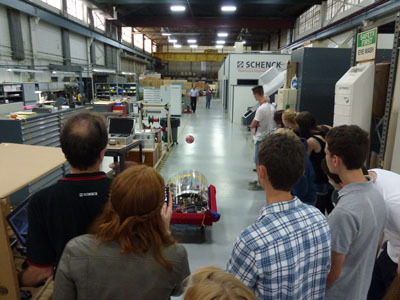 On August 5 more than 20 students got a demo and a chance to drive and shoot soccer balls along the Schenck factory floor. We were selected as one of the 2015 Control system Beta Testing teams and received the new system in mid-August. A small group had to sign special disclosure agreements before we were allowed to start working. Our objectives include creating a benchtop test hardware setup, installing the new system on an old robot, testing extreme conditions and whatever else we can think of to stress the new system. We're responsible for recommending improvements to the user documentation, identifying software and hardware issues, and making suggestions for firmware adjustments. Photos and what we've learned are documented on the page linked above. We participated in a December FIRST webcast on Beta testing the new control system. We took the new control system on tour to local teams, such as Smithtown 810, Half Hollow Hills 3624, Plainview-Old Bethpage 353, the Bridgehampton rookie team 5659, Miller Place 514, Huntington 5016, Northport 5099, Center Moriches 4458, Longwood 564, and off-season events at Balston Spa, NY, Flourtown, PA, North Brunswich, NJ, and Deer Park, NY. Some wired it all up so they now have direct experience. It was very unusually early this year, Sept. 13. Rosalie had a trailer and Mr. Kraft had a pickup to pull it. 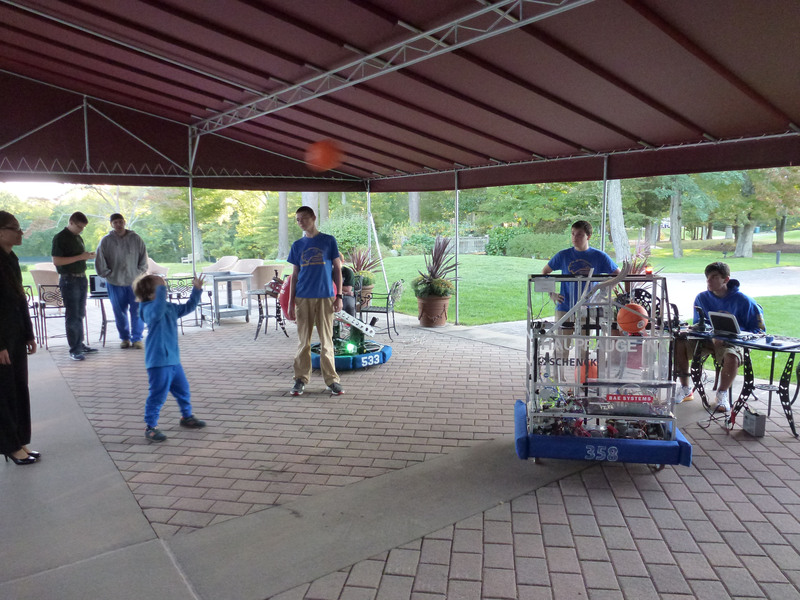 The basketball robot was loaded with candy to throw and the crowds were gathering. We were all lined up at Whiporwil with other groups ready to start when the rain started coming down pretty steadily. Now with all the fire trucks, cars and floats already in position, that just meant most of the foot marchers got to ride the yellow school buses in the parade back to the high school. It took just as long as the parade ever does. We all drove the parade route very slowly. People came out to see us protected by canopies, umbrellas, from their home picture windows, or perched inside the hatch of their car. 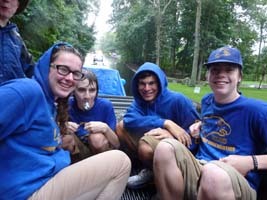 A half dozen robotics members rode the pickup pulling the robot hidden by a tarp, tossing candy to all the children along the route. The robotics members got quite soaked, but didn't seem to care too much. We did hold all their cell phones in the truck cab for protection from the elements though. Back at the school we unloaded, and then the rain let up for us to have our fundraising tent out by the football field. The Robotics Club took on the ALS Ice Bucket Challenge that was issued by the founder of FIRST, Woody Flowers. After drying out from the Homecoming parade we decided to get wet again. The goal is to try to get this going among all the Robotics Club's to raise more money for ALS. 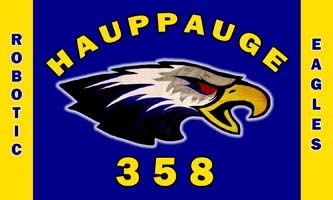 They nominated TBirds, Smithtown & Half Hollow Hills. They raised $123 so far, but if you did not get a chance to donate, please bring an envelope with a $5 suggested donation (s/b $10 if you didn't do the challenge J) to Mr. Dowd or Sal Sparacino. Thanks to Debbie Caiola for great action shots and thanks to Ethan for the video. SBPLI Golf Fundraiser One of our robots made it's usual appearance at the annual SBPLI Golf Outing, a fundraiser supporting all the FIRST programs on Long Island. Lindenhurst FRC team 533 and Plainview-Old Bethpage FRC team 353, along with a Girl Scout FLL team were also there to talk to sponsors, supporters, and golfers about the FIRST programs. Festo Manufacturing Day As part of a nationwide manufacturing Day (really takes place over the first couple of weeks of October) Festo opened it's doors to tours. So our team participated on Saturday, October 11. Other companies around the island also held tours for local teams. Arbor's Assisted Living Fall Festival This retirement home in Islandia was having a Fall Festival on Columbus Day and invited us, through Rosalie who volunteers there, to bring in a robot and students to entertain the residents. We took the basketball robot as it's soft foam basketballs is the most indoor friendly. The team officers ran the robot non-stop for three hours as residents came watched and talked about the robot with the students. Several residents tried their hand at shooting basketballs. Towards the end of the day volunteers running other activities during the day collected in the robot demonstration room and also took turns driving or picking up/shooting balls. Safe Halloween It was another year of playing basketball with a robot for the spooky tikes that came to the high school's pre-Holloween indoor/afternoon celebration. Half Hollow Hills Invitational Another fun off-season competition where lots of team mmbers got the opportunity to drive our robot in competition. We also had new members from the upcoming rookie teams of Bridgehampton and Kings Park visit and we took them around and involved them in the competition. 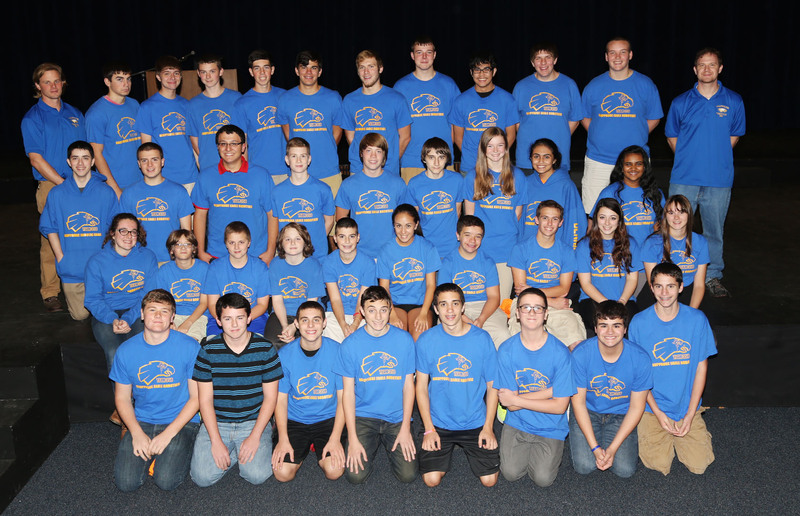 Robotics Conference at Hauppauge High School A good day with 16 schools and about 70 people attending. That's one third of all Long Island teams represented. We had speakers from Webb Institute, retired team leaders/tech teachers from Miller Place/Plainview-Old Bethpage, a Control Systems Advisor for the SBPLI Regional, and the Hauppauge Beta group for the 2015 Control System. Lots of opportunities for networking and socializing without the pressure and distraction of competition that we usually have when we're together. Pizza orders for lunch were taken and pies ordered from Mama Sbarro's. We sold pizza, water, soda, snacks & baked goods - we made $288! Thanks to Mama Sbarro's who gave us a great deal on all those pizzas. 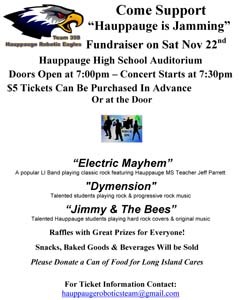 Our last minute fundraiser to replace the failed Oldies Concert this year. We had the auditorium reserved so we found a way to use it and recoop some of the income lost that the team usually raises from our biggest moneymaker of the year. Local musicians stepped up to provide the entertainment. Our annual demonstration at the Middle School during their science fair open house after hours for the parents to come and see. We competed at the New York City event, at the SBPLI event at Hofstra (where we were awarded the Engineering Excellence trophy) and at Championship in St. Louis in the new Tesla sub-division. 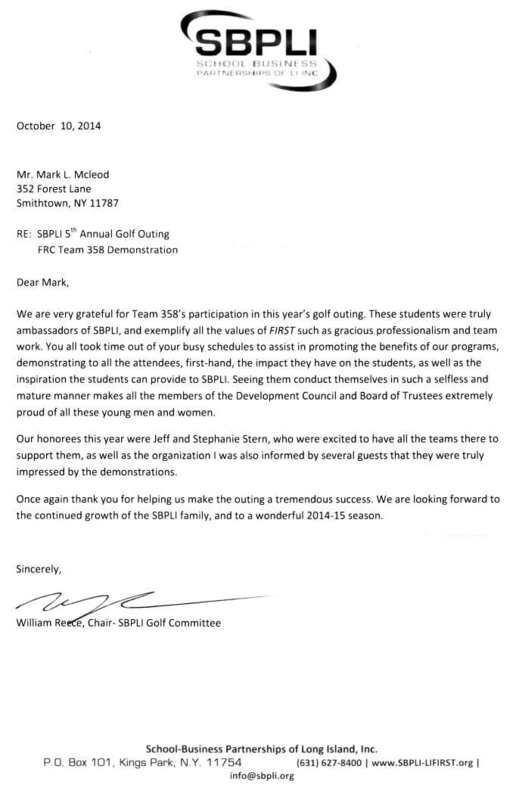 We got a spot at Championship through the waitlist that we signed up for immediately when it opened. The week after returning from Championship we did a joint robot demonstration with Great Neck South at a Presbyterian church in Garden City for some Lego teams looking to start an FRC team in Garden City in two years for their matriculating students.